Home Tags Posts tagged with "park geun hye impeachment"
Voters in South Korea are going to polls to elect a new president after a huge corruption scandal brought down the former leader, Park Geun-hye. 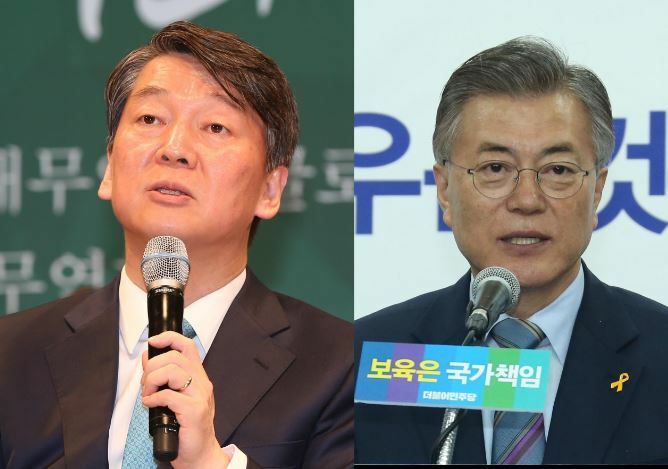 Liberal Moon Jae-in is the strong favorite with centrist Ahn Cheol-soo his nearest challenger. South Korea’s economic issues are a big concern for voters but the election could see a shift in policy towards North Korea. Moon Jae-in wants to increase contact with North Korea in contrast to impeached President Park Geun-hye who cut almost all ties. A record turnout is predicted, with numbers boosted by younger voters, as South Koreans choose from 13 candidates. Polls close at 20:00 local time, with the winner expected to be announced soon after. The new leader is likely to be sworn-in on May 10. Heightened tensions on the Korean peninsula in recent weeks have made the perennial worries over the South’s volatile neighbor a key issue. Moon Jae-in, of the Democratic Party of Korea, has advocated greater dialogue with North Korea while maintaining pressure and sanctions. Both Moon Jae-in and Ahn Cheol-soo have urged President Donald Trump to cool his rhetoric towards North Korea after his administration suggested it could take military action over Pyongyang’s nuclear program. 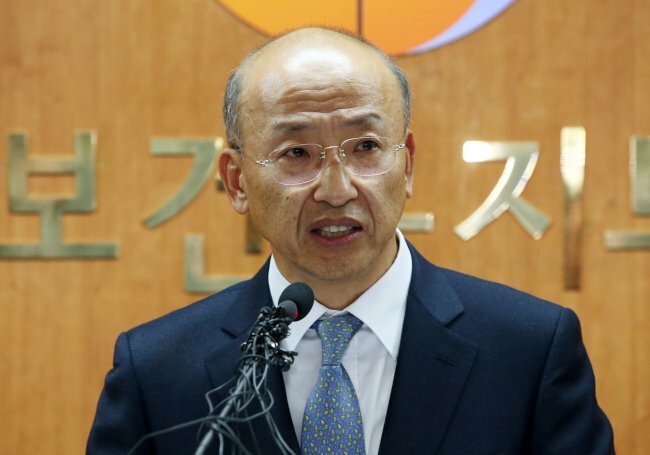 However, Hong Joon-pyo of the conservative governing Liberty Korea Party has attacked Moon Jae-in’s approach, saying last week that the election was a “war of regime choices”. North Korea state media said it favored a return to an earlier era of communication and co-operation known as the Sunshine policy, seen as an endorsement of Moon Jae-in who was part of the previous South Korean government which promoted that policy. All the candidates are promising to protect the fragile recovery in the country’s economy – the fourth largest in Asia – and to bring down youth unemployment, which remains stubbornly high. There have been vows to reform the family-run conglomerates – chaebols – which dominate the domestic economy. Whoever wins will have to tackle ties with China, which retaliated economically over the deployment of a US missile defense system in South Korea. All candidates have been promising a break from the past as symbolized by the deeply unpopular Park Geun-hye. Prosecutors asked for an arrest warrant for South Korea’s former president Park Geun-hye, for her role in a corruption scandal. Earlier this month, Park Geun-hye lost her presidential immunity and was dismissed from her post when the constitutional court upheld a decision by parliament to impeach her. She is accused of allowing her close friend Choi Soon-sil to allegedly extort money from big companies. Park Geun-hye, 65, has denied the allegations. She apologized to the public last week, before being questioned by authorities for 14 hours. They argue that evidence like computer hard drives might be destroyed if Park Geun-hye is not arrested. Choi Soon-sil has been charged with bribery and corruption and is already on trial. She is accused of using her presidential connections to pressure companies to give millions of dollars in donations to non-profit foundations she controlled. Lee Jae-yong, the acting head of electronics conglomerate Samsung, was arrested for his role in the scandal. Park Geun-hye is alleged to have been personally involved in this, and to have given Choi Soon-sil unacceptable levels of access to official documents. Parliament voted to impeach Park Geun-hye in December 2016. On March 10, the constitutional court ruled that Park Geun-hye’s actions “seriously impaired the spirit of… democracy and the rule of law”. Judges said the president had broken the law by allowing Choi Soon-sil to meddle in state affairs, and had breached guidelines on official secrets by leaking numerous documents. Park Geun-hye had “concealed completely Choi’s meddling in state affairs and denied it whenever suspicions over the act emerged and even criticized those who raised the suspicions,” the ruling said. The Seoul Central District Court will now determine whether there are grounds to issue the arrest warrant for Park Geun-hye. If it is issued, prosecutors will have up to 20 days to continue investigations and file charges against her, Reuters reports. As president Park Geun-hye had enjoyed immunity and repeatedly refused to take part in questioning. Now Park Geun-hye could face several charges, including abuse of power, coercion, bribery and leaking government secrets. Impeached South Korean President Park Geun-hye is being questioned by prosecutors over the country’s biggest corruption scandal that brought her down. After arriving at the office, Park Geun-hye told reporters she was “sorry”. Park Geun-hye, 65, resisted efforts to question her when she was president, but lost her immunity when judges upheld parliament’s decision to impeach her. The ousted leader could be charged for allegedly allowing close friend Choi Soon-sil to extort money from large companies. Choi Soon-sil has been charged with bribery and corruption. On March 21, Park Geun-hye’s supporters gathered outside her home in an affluent suburb of Seoul, as she was escorted by police to the prosecutors’ office in a short journey covered live on TV. People waved the South Korean flag, a symbol of the pro-Park movement. “I am sorry to the people. 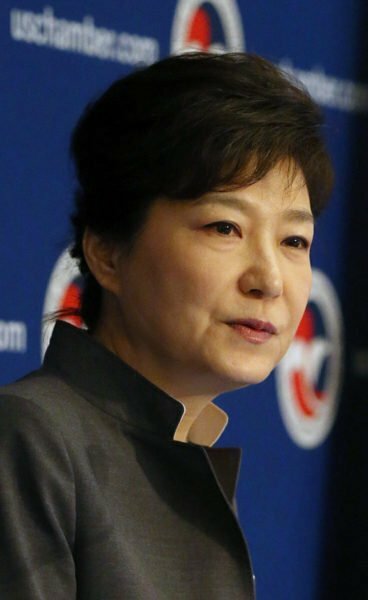 I will faithfully cooperate with questioning,” Park Geun-hye told the media when she arrived. She is the first democratically elected leader to be ousted in South Korea. Thousands of people celebrated in Seoul after Park Geun-hye’s removal from office on March 10. However, there were also angry protests by her supporters outside the Constitutional Court. The court ruling was the culmination of months of political turmoil and public protest. An election now will be held by May 9. PM Hwang Kyo-ahn, who is loyal to Park Geun-hye, is now the acting president. At the heart of the drama lies the close friendship between Park Geun-hye and Choi Soon-sil. Choi Soon-sil is accused of using her presidential connections to pressure companies to give millions of dollars in donations to non-profit foundations she controlled. Judges said she had broken the law by allowing Choi Soon-sil to meddle in state affairs, and had breached guidelines on official secrets by leaking numerous documents. Prosecutors are now questioning Park Geun-hye in what could be a lengthy days-long process. They had previously accused Park Geun-hye of colluding with Choi Soon-sil, which the former president has strenuously denied. She had also previously refused to take part in investigations. After losing her presidential immunity, Park Geun-hye could be charged for abuse of power and coercion to bribery. South Korean animal rights groups have accused impeached President Park Geun-hye of abandoning her dogs when she left the presidential palace. The row comes as Park Geun-hye was called for questioning and named as a suspect in the wide-ranging corruption scandal that eventually led to her downfall. The ousted leader was dismissed from her post last week when the constitutional court upheld her impeachment. South Korea will hold its presidential election on May 9. Park Geun-hye is South Korea’s first democratically elected leader to be ousted. Over the weekend she left the presidential palace, known as the Cheong Wa Dae, and moved into her house in an affluent district of Seoul. Park Geun-hye’s nine Jindo dogs were not among the entourage that accompanied her. The Busan Korea Alliance for the Prevention of Cruelty to Animals (Busan KAPCA) noted the impeached president could have violated animal protection laws by leaving the dogs behind. The group, along with the Coexistence of Animal Rights on Earth (CARE), claimed Park Geun-hye had abandoned her pets, and both organizations offered to find new homes for the dogs. A Cheong Wa Dae spokesman denied Park Geun-hye had abandoned her dogs, and told Reuters that they were left at the palace partly because it would not be good for them to be uprooted from their home. “She told… staff to take good care of the dogs and to find good foster homes for the puppies if necessary,” said the spokesman. Park Geun-hye was known to be fond of her pets, which had been dubbed the country’s “First Dogs,” the Korea Times reported. When Park Geun-hye was inaugurated as president in 2013, she moved into Cheong Wa Dae with a pair of Jindo dogs which were given to her as a present. The pair later produced several puppies, some of whom she kept while others were adopted. Jindo dogs are known for their loyalty and devotion. South Korea has been run by PM Hwang Kyo-ahn since parliament voted to impeach Park Geun-hye in December. The date for the next presidential election was set at a cabinet meeting on March 15. At that meeting, Hwang Kyo-ahn said he would not run in the election, dealing a blow to conservatives looking for viable candidates, reported Yonhap news agency. Park Geun-hye has also been summoned by prosecutors for questioning on March 21 over her alleged involvement in the corruption scandal surrounding presidential aide Choi Soon-sil. She is accused of colluding with Choi Soon-sil in extorting large amounts of money and favors from conglomerates. Park Geun-hye has denied all accusations and refused previous requests to take part in investigations. Calls for ousted President Park Geun-hye’s arrest are growing in South Korea. Park Geun-hye was forced from office on March 10, after judges unanimously upheld parliament’s decision to impeach her over her role in a corruption scandal involving close friend, Choi Soon-sil. Despite the ruling, Park Geun-hye remains inside the presidential compound. Thousands turned out for rallies in Seoul on March 11, a day after three people involved in protests died there. Many were calling for the impeached president’s arrest, although a smaller number of her supporters also gathered in nearby streets. There are fears the two sides may clash and there is a heavy police presence. A spokeswoman for the protesters supporting the court’s decision, Choi In-sook, told Reuters they were demanding the arrest of Park Geun-hye. She has lost her presidential immunity and could face criminal charges. Meanwhile, South Korea’s election commission announced a “free and fair” vote would be held by May 9 at the latest. Currently, Moon Jae-in of the Democratic Party is leading in the polls, with one survey putting him almost 22% ahead of his nearest rival, acting president Hwang Kyo-ahn, who is loyal to Park Geun-hye. Hwang Kyo-ahn has called for calm, saying the government should remain stable to prevent internal conflict from spreading. However, police are bracing themselves for more violence following the deaths of two of Park Geun-hye’s supporters on March 10. A third person, aged 74, is understood to have had a heart attack during March 10 protests, and died on the next day, according to Reuters. Park Geun-hye’s office said she would not be leaving the Blue House, South Korea’s presidential palace, on March 10 nor making any statement. It is understood Park Geun-hye will not leave until her own home in Seoul is repaired and cleaned. President Park Geun-hye has become South Korea’s first democratically elected leader to be forced from office. Judges unanimously upheld parliament’s decision to impeach Park Geun-hye over her role in a corruption scandal involving her close friend, Choi Soon-sil. Park Geun-hye now loses her presidential immunity and could face criminal charges. There have been angry scenes outside the court. Police said two protesters had died. The court ruling is the culmination of months of political turmoil and public protest. An election must now be held within 60 days. On March 10, Park Geun-hye’s office said she would not be leaving the Blue House, South Korea’s presidential palace, nor making any statement. Acting President Hwang Kyo-ahn has called for calm, saying the government should remain stable to prevent internal conflict from spreading. At the heart of the drama lies Park Geun-hye’s close friendship with Choi Soon-sil. Parliament voted to impeach Park Geun-hye in December 2016 and the Constitutional Court has since been deciding whether to uphold or overturn this. On March 10, a panel of eight judges ruled Park Geun-hye’s actions “seriously impaired the spirit of… democracy and the rule of law”. The court said the president had broken the law by allowing Choi Soon-sil to meddle in state affairs, and had breached guidelines on official secrets by leaking numerous documents. Park Geun-hye had “concealed completely Choi Soon-sil’s meddling in state affairs and denied it whenever suspicions over the act emerged and even criticized those who raised the suspicions,” it said. However, the judges dismissed some charges, including accusations Park Geun-hye had infringed on freedom of the press by creating a media blacklist of cultural figures, and criticism of her response during the 2014 Sewol ferry disaster. Samsung vice-president and heir apparent Lee Jae-yong is to be formally indicted on multiple charges including bribery and embezzlement, South Korean prosecutors said. The case is tied to the Choi Soon-sil scandal which led to the impeachment of South Korea’s President Park Geun-hye. The special prosecutor’s office announced the charges against the de-facto Samsung chief, along with four other company executives. Three of those executives resigned on February 28 following the announcement. Samsung also said it was dismantling its corporate strategic office, a unit coordinating the various arms of the huge conglomerate. The tech giant is accused of giving donations to non-profit foundations operated by Choi Soon-sil, a close friend of President Park Geun-hye, in exchange for government favors. Lee Jae-yong had been arrested earlier this month as prosecutors prepared the indictment. Prosecutors accused Lee Jae-yong of giving donations worth 41 billion won ($36 million) to organizations linked to Choi Soon-sil. They alleged this was done to win government support for a big restructuring of Samsung that would help a smooth leadership transition in favor of Lee Jae-yong, who is standing in as chairman for his ill father, Lee Kun-hee. The controversial merger required support from the national pension fund – the allegation is that this support was granted in return for the donations. In a December parliamentary hearing, Samsung admitted giving a total of 20.4 billion won to two foundations, but denied seeking favors in return. Lee Jae-yong also confirmed the company gave a horse and money to help the equestrian career of Choi Soon-sil’s daughter, Chung Yoo-ra, something he said he now regrets. This centers around President Park Geun-hye’s ties to Choi Soon-sil and has brought allegations of cult activities, influence-peddling and leaks of classified information. Choi Soon-sil is a long term family friend whose father had already had close ties with President Park’s father who was president in the 1970s. As well as soliciting donations, Choi Soon-sil is accused of using their friendship to interfere in politics. Choi Soon-sil is now on trial charged with various offences, including abuse of authority, coercion and attempted fraud, and denies wrongdoing. In December 2016, the parliament voted to impeach President Park Geun-hye. Her case is now being heard by the constitutional court. Meanwhile she has been stripped of her presidential powers. Regardless of the outcome, Lee Jae-yong’s trial is a big blow to Samsung. His arrest may not affect short term production or the running of the firm but there could be long term implications. Samsung is one of the biggest electronics companies in the world and for the head of a company that thrives on a premium brand image to be involved in a corruption scandal is a huge embarrassment. Earlier in February, when Lee Jae-yong was first arrested, Samsung said it would do its best “to ensure that the truth is revealed in future court proceedings”, though denies wrongdoing. South Korea’s opposition seeks the impeachment of acting president Hwang Kyo-ahn over his decisions on the country’s corruption scandal. The interim leader decided not to extend a special prosecutor’s investigation which involves his predecessor, President Park Geun-hye. Prosecutors want more time to question her over the scandal. Park Geun-hye is awaiting a separate ruling on her December impeachment from the constitutional court. She is still technically president, though she has been stripped of her powers while the constitutional court decides her fate. As long as she remains president, she is immune from prosecution. 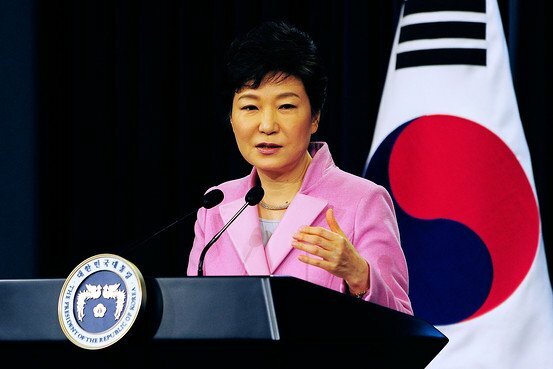 However, the wider corruption investigation which emerged from the scandal will now end on February 28, before special prosecutors have the opportunity to question Park Geun-hye. Any further investigation will fall to individual state prosecutors. 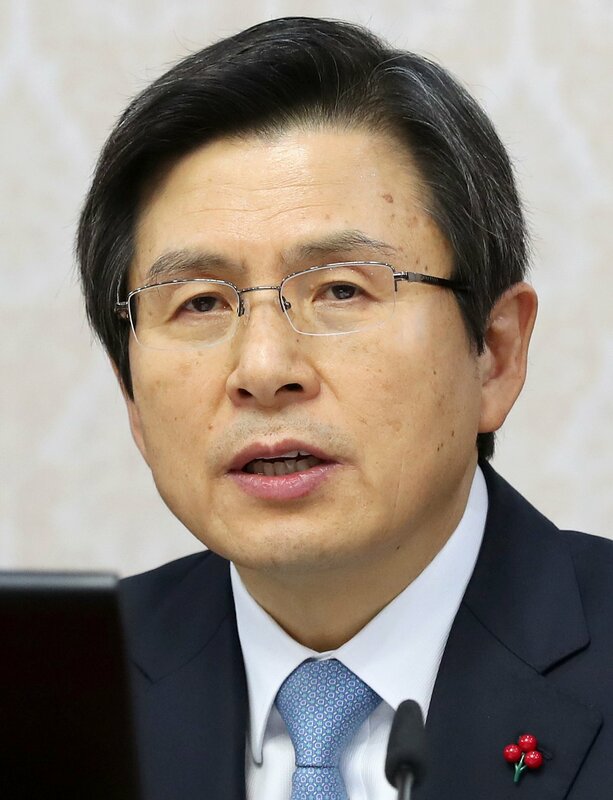 Hwang Kyo-ahn, who remains prime minister while he sits in for the president, said that continuing the investigation is not in the best interests of the nation. 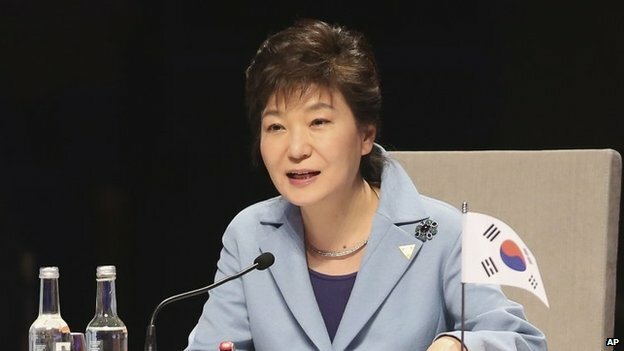 Choo Mi-ae, leader of the main opposition Democratic Party, said Hwang Kyo-ahn’s decision indicated he was trying “to become Park’s shield to protect her and her associates”. Park Geun-hye was impeached weeks after her old friend Choi Soon-sil was arrested. Choi Soon-sil is accused of using her presidential connections to pressure companies for millions of dollars in donations to two non-profit foundations she controlled. President Park Geun-hye is alleged to have been personally involved. On November 20, Choi Soon-sil was charged with various offences, including abuse of authority, coercion, attempted coercion and attempted fraud, leading to the wider investigation. 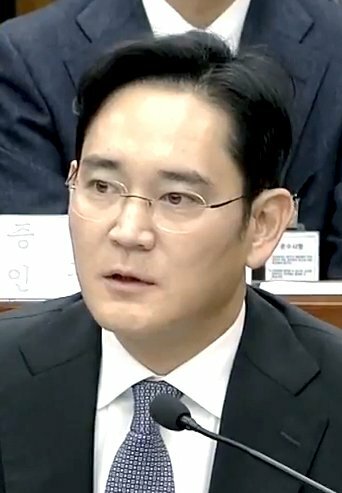 Samsung vice-president was also arrested in connection with the probe. The company is accused of giving donations to non-profit foundations operated by Choi Soon-sil in exchange for government favors. Park Geun-hye’s case at the constitutional court also heard the final arguments on February 27. It is not known when the final verdict will be delivered. The court may reject Park Geun-hye’s impeachment, restoring her powers and returning the country to its status quo. If, however they uphold the parliament’s decision, a presidential election must be held. Hundreds of thousands of protesters have taken to the streets calling on ousted President Park Geun-hye to step down immediately, rather than continue to fight her impeachment in the constitutional court. South Korean President Park Geun-hye has failed to attend a constitutional court hearing on her impeachment. The session was closed after nine minutes and postponed to January 5 because of her absence. On December 9, the parliament voted to impeach Park Geun-hye over a corruption scandal. Park Geun-hye’s close friend Choi Soon-sil has been charged with abuse of power. The president is alleged to have been involved as well, which she denies. Her impeachment case is being heard in a court by nine judges. They have 180 days to decide whether Park Geun-hye, who has been suspended from duties, should go or stay. Though the court has requested her presence, Park Geun-hye’s lawyer has said she will not attend “unless there are special circumstances”, Yonhap news agency reported. If Park Geun-hye fails to appear for a second time on January 5, the hearing can proceed without her. According to the Korea Times, the justices will be assessing whether she abused her power, took part in bribery and violated the rule of law, among other issues. Park Geun-hye met reporters on January 1 to strongly deny allegations from prosecutors that she was involved in Choi Soon-sil’s dealings, calling them “distorted and false” suspicions. Choi Soon-sil is said to have used her close relationship with Park Geun-hye to pressure companies into donating to two foundations which she controlled, and then siphoned off funds for her personal use. The scandal has rocked South Korea, which has seen multiple mass protests calling for Park Geun-hye to step down and apologize. The president has admitted giving Choi Soon-sil inappropriate access to government decisions and has publically apologized for this several times. Separately, South Korean authorities said on January 3 they were proceeding with the extradition of Choi Soon-sil’s daughter, Chung Yoo-ra. Chung Yoo-ra, a former national equestrian, was arrested in Denmark on January 1 for staying in the country illegally. Part of the investigation into Choi Soon-sil’s activities relates to a gift horse from Samsung to her, allegedly for Chung Yoo-ra’s training. Academics from the prestigious Ewha Women’s University in Seoul are also being investigated for admitting Chung Yoo-ra and allegedly giving her preferential treatment. The chairman of South Korea’s pension fund, Moon Hyung-pyo, has been arrested for alleged corruption acts involving Samsung and President Park Geun-hye. State prosecutors said they raided the National Pension Service (NPS) chairman’s home on December 26, before arresting him on December 28. The NPS is the world’s third-largest pension scheme. Moon Hyung-pyo’s arrest comes amid President Park Geun-hye’s impeachment over the scandal involving her close friend Choi Soon-sil. In the latest arrest, investigators are looking into NPS’s support of an $8 billion merger between two Samsung Group affiliates and whether Moon Hyung-puo used his influence as health minister at the time, to pressure it to back the deal. The Ministry of Health and Welfare runs the pension service, which manages 545 trillion won ($451 billion) and was a major shareholder in Cheil Industries Inc and Samsung C&T Corp when they merged. The NPS has denied previous reports that Moon Hyung-pyo pressured the organization to back the deal, and he told reporters on December 27 that he would cooperate with the investigation. The scandal has also caught Samsung up in allegations that it backed foundations controlled by Choi Soon-sil in the hope of receiving political favors, which investigators are also examining. Politicians voted this month to impeach President Park Geun-hye – a decision South Korea’s constitutional court has six months to uphold or overturn. Until then Park Geun-hye remains formally president but stripped of her powers, which are handed to the prime minister, a presidential appointee. Park Geun-hye denies wrongdoing but has apologized for the way she managed her relationship with Choi Soon-sil, who also denies committing criminal offences. 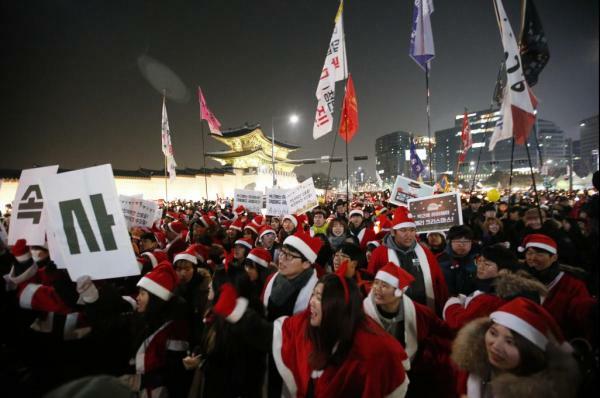 South Koreans protesters dressed as Santa Claus have marched through the streets of Seoul calling for the immediate removal of President Park Geun-hye. The festive protest marks the ninth week of rallies against the South Korean president. Earlier this month South Korea’s parliament has voted to impeach Park Geun-hye over a corruption scandal, but that decision has to be confirmed by the country’s constitutional court. Tens of thousands of demonstrators demand the president to resign at once. Organizers say more than 550,000 people joined the ranks marching towards the presidential Blue House, the prime minister’s office and the constitutional court. Police figures were not available. The crowd chanted “Arrest Park immediately!” and sang along to Christmas songs whose lyrics they had changed to mock the president. The scandal which has engulfed President Park Geun-hye centers on her relationship with long-time friend Choi Soon-sil, who faces charges of coercion and abuse of power. It is alleged that after Park Geun-hye became president in 2013, Choi Soon-sil, 60, used their friendship to pressure top companies into donating to foundations she controlled, and then siphoned off funds for her own gain. Prosecutors are also investigating new allegations that Choi Soon-sil sent dubious assets worth hundreds of millions of dollars overseas. Park Geun-hye’s one-time ally has been in custody since October, and was brought to a special prosecutors’ office to be questioned on December 24. President Park Geun-hye has been suspended from her duties since the impeachment vote on December 9, but insists she will wait “calmly” until the constitutional court delivers its decision. If the constitutional court confirms her impeachment, Park Geun-hye will be permanently removed from office, and elections will be held within 60 days. Tens of thousands of South Koreans have marched in Seoul to celebrate the impeachment of President Park Geun-hye and demanding her full removal. Park Geun-hye is suspended while the top court considers whether to uphold December 9 parliamentary vote to impeach her. She is accused of allowing a close friend to profit from her connections with the presidency. According to correspondents, the gathering, estimated at 200,000 by organizers, was smaller than in recent weeks. The motion to impeach Park Geun-hye passed by 234 votes to 56, meaning many members of her Saenuri party voted in favor. Park Geun-hye’s supporters held a Seoul rally that drew an estimated 15,000 people on December 10. Waving national flags, they carried banners that read: “President Park, Don’t Cry” and “Nullify impeachment”. At the heart of the case is Park Geun-hye’s relationship with long-time friend Choi Soon-sil, who faces charges of coercion and abuse of power. It is alleged that after Park Geun-hye became president in 2013, Choi Soon-sil, 60, used their friendship to pressure powerful corporations into donating to foundations she controlled and then siphoned off funds for her personal use. Prosecutors say Park Geun-hye had a “considerable” role in the alleged corruption, which she has denied. The Constitutional Court has 180 days to make a final ruling. If at least six of the court’s nine judges rule against Park Geun-hye, she will become the first sitting South Korean president to be deposed in the country’s democratic era and a new presidential election will be held within 60 days. South Korea’s President Park Geun-hye has been impeached over a corruption scandal after parliament voted with 234 to 56. The number of votes on impeachment motion shows that some members of Park Geun-hye’s ruling Saenuri party voted in favor. PM Hwang Kyo-ahn has become interim president. Thousands of people took to the streets in recent weeks demanding Park Geun-hye’s removal. After the vote, she again apologized that she had “created this national chaos with my carelessness”. At the heart of the crisis is the relationship between Park Geun-hye and her close friend Choi Soon-sil, who stands accused of using her connections to gain influence and financial benefits. Choi Soon-sil is now in custody, facing charges of coercion and abuse of power. Hwang Kyo-ahn, 59, spent most of his career as a prosecutor, is now acting-president. He had earlier served as justice minister, before becoming prime minister in June 2015. In 2014, as justice minister, Hwang Kyo-ahn oversaw the banning of the Unified Progressive Party, which was accused of holding pro-North Korean views. The move was criticized by the human rights group Amnesty International. Choi Soon-sil, the South Korean president’s friend who is accused of being behind a massive corruption scandal in the country has been ordered to appear before a parliamentary hearing. She has been charged over allegations she colluded with President Park Geun-hye to gain influence and money for herself. Park Geu-hye, who denies corruption, faces an impeachment hearing on December 9. Amid ongoing street protests, Park Geun-hye has said she will resign once parliament finds a way for her to do so smoothly. The parliamentary hearing in Seoul is questioning the heads of some of South Korea’s biggest companies, including Samsung, Hyundai, SK, Lotte and LG. All the companies gave large donations to foundations run by Choi Soon-sil. They are being quizzed over whether the donations were used to gain them favorable treatment by the government. All have denied improper activity, though suggested there had been pressure to make donations. One of the corporate bosses acknowledged that it was difficult for companies to say no to government requests. “It’s a South Korean reality that if there is a government request, it is difficult for companies to decline,” said Huh Chang-soo, head of the GS Group and chairman of the Federation of Korean Industries lobby group. Choi Soon-sil, who is in police detention along with two other aides of Park Geun-hye, has so far refused to attend the hearing as a witness, citing ill health. However, on December 7 she and several other key witnesses, including members of her family, were ordered to appear. “This hearing is being criticized as a Choi Soon-sil trial without Choi Soon-sil,” said the committee chairman Kim Sung-tae, according to the AFP. Kim Sung-tae said the panel would “undertake all measures” to make her and other witnesses appear, before sending security officers to collect the group. They could face jail or fines if they refuse. The extraordinary scenes are being broadcast live on TV. The panel has no power to punish but its chairman has said the hearing is a place for apologies. President Park Geun-hye has apologized multiple times to the public for allowing Choi Soon-sil inappropriate access to government decisions but has stopped short of resigning.